Insure your house, auto, boat and more with Guerin’s personal insurance policies. Learn more about our personal “package” policies and request a quote. Our commercial insurance policies are designed with the broadest coverage available to fulfill your specific business needs. The Guerin Insurance Agency, a founding member of The Northlake Insurance Group, is now celebrating over 53 years in business. It is one of the oldest, locally owned independent insurance agencies in Southern Tangipahoa Parish providing both personal and commercial lines. The Guerin Agency was founded in 1962 by Harold Guerin, and continues as a family-owned agency, now in its third generation. John, Nanette, John Daniel Guerin, and Marquette Guerin Pegler, along with Libby Billiot, Ana Sanchez, and Lauren Edwards provide insurance protection for families and businesses in Hammond and the Tangipahoa Parish area. 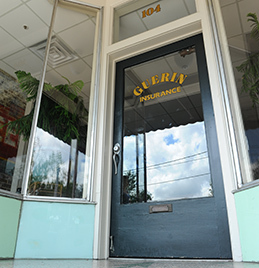 The Guerin Insurance Agency is conveniently located in the heart of the Historic District of Downtown Hammond. All members of the Guerin Agency are actively involved in civic and community affairs, serving on various boards, committees and commissions. The Guerin Agency is committed to providing expert insurance solutions while specializing in customer service through personal attention for both personal and commercial business.